A street in Leeds city centre is the most polluted outside London, an environmental group has claimed. 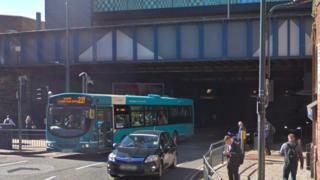 Parts of Neville Street, near the train station, had a nitrogen dioxide (NO2) level of 99 ug/m3, Friends of the Earth said. The group said council figures showed the level was more than twice the suggested limit of 40ug/m3. Leeds City Council said it monitored air quality at the city's worst polluted sites. Campaigners assessed local authority air quality reports submitted to the government, including those contained in Leeds council's latest air quality report. Councillor James Lewis said the council was "committed to improving air quality" and recognised "air pollution exceeds legal limits in some parts of Leeds". However, the council measured air quality at busy junctions and tunnels even though it was not required to by official guidelines, he said. Mr Lewis added: "Individuals can do their bit by using the car less often, sharing their journeys more often, and by turning off their engines when idling." The owners of heavy polluting lorries, coaches, taxis and private hire vehicles are to be charged for entering parts of Leeds from January 2020. Friends of the Earth welcomed the initiative but wants cars to be included and the charging zone to be extended. Simon Bowens, from the organisation, said: "Air pollution is often an issue thought of as affecting only the biggest cities. "The reality is that unacceptably toxic air can be found across much of the UK, even in smaller towns. "It is harming the health of people across the country and is especially bad for young children whose lungs are still developing."